What does the Sacrament mean to a Mormon? The broken bread reminds Church members of the Savior’s body, His suffering, and that through His mercy everyone will be resurrected and given the opportunity to obtain eternal life. The water is symbolic of the Savior shedding His blood in suffering and anguish which started in the Garden of Gethsemane and ended on the cross. This ordinance is an important part of worship and spiritual progression. Through this ordinance, Church members renew the covenants they made with God when they were baptized such as promising to obey Heavenly Father’s commandments and to always serve Him. In exchange for keeping these covenants, the Lord promises that we can have the constant companionship of the Holy Ghost, the remission of sins, and the blessing of being spiritually reborn. In preparation of partaking of the sacrament, Church members take time to examine their lives and repent of sins. Members should have a humble and repentant heart in order to participate in the sacrament. The Sacrament is administered by priesthood bearers who have authority. As revealed in modern revelation, Priests in the Aaronic Priesthood and any Melchizedek Priesthood holder may officiate at the table. 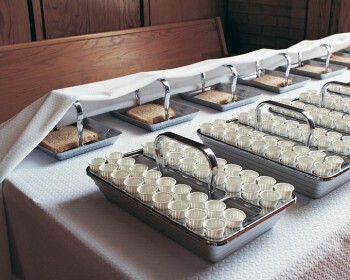 The sacrament table is prepared by teachers in the Aaronic Priesthood, and the bread and water are blessed by priests and passed to the members of the Church by deacons in the same priesthood. The sacramental prayers over the bread and water are scripturally exact as revealed by the Lord. The Sacrament blesses my life each and every week. I am so grateful for the opportunity to renew my covenants with my Heavenly Father. Partaking of the sacrament provides me with a sacred moment in a holy place where I can spiritually grow. Being involved in such a sacred ordinance more fully helps me realize the special blessing of being able to participate in it and its significance in my life – that Jesus Christ atoned for my sins and only through Him can I repent and one day live in His presence again.